IDF forces seize boat attempting to break naval blockade of Gaza by sailing out of Gaza, tow craft to Ashdod naval base. The IDF seized a boat which was launched from the Gaza Strip in an attempt to break Israel's partial blockade of the Hamas-run enclave Tuesday. 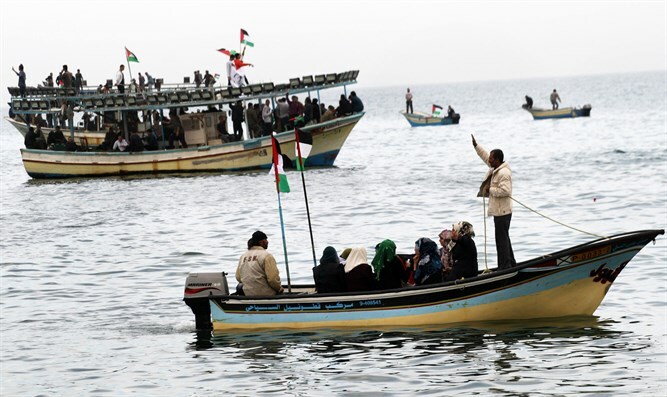 The seized boat was launched as part of the “reverse flotilla," an attempt to mirror efforts by prior flotillas which attempted to force their way to the Gaza Strip from the Mediterranean by running the blockade in the opposite direction. The IDF stated that 17 sailors were on the seized boat. The IDF also sent medical forces to treat any sick or injured people who may have been on board. The boat will be towed to the naval base in Ashdod. Special US envoy to the Middle East Jason Greenblatt slammed Hamas over the planned flotilla Monday, calling it a ‘cynical’ bid to preserve the terror organization’s power. Israel has imposed a naval blockade on Gaza for over a decade, meant to prevent weapons from being transferred into the hands of terrorists in Gaza, including the ruling Hamas organization.